Compare discounts for Hotels Resorts in Marco Island, Florida! About four miles wide and six miles long, Marco Island is located at the northwestern edge of the Everglades National Park, about 15 miles south of Naples, FL. In days long gone Marco Island used to be an ancient Indian colony and since the last days of the 19th century it has been transformed into a world-class resort community. These days over 15,000 people call Marco Island their home and numerous visitors from all over the world come year round to enjoy the sun and the sea. Crisscrossed with canals and bays, Marco Island boasts beautiful sandy beaches on the Gulf of Mexico side of the Island. It also offers superb fly fishing opportunities and a host of water sports activities. Accommodation options include mostly upscale beachfront hotels and condominium resorts that cater mainly to visitors on a getaway vacation. Note: Lists are not identical. 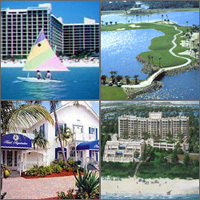 Different sites offer different accommodation options for Marco Island. Located off the southwest coast of Florida on the largest of the Ten Thousand Islands, the Marco Island Marriott Resort Golf Club and Spa blends the tropical charisma of the islands with an unrivaled array of amenities for an enchanting and unforgettable island escape. The Hilton Marco Island Beach Resort is a beautiful, beachfront, deluxe resort located on Marco Island, just minutes from Naples. The Marco Beach Ocean Resort is a boutique, beachfront resort overlooking the Gulf of Mexico. The resort is located 45 miles from the Ft. Myers International Airport and 100 miles from the Ft. Lauderdale Airport. The intimate Beach Club of Marco Island is just steps away from the pristine white sand beach of the Gulf of Mexico and less than half a mile from the shops and restaurants of Marco Island. The Olde Island Inn and Suites is a first class hotel located 40 miles from Regional South West Airport in Fort Myers. Located right on the beach, The Marco Island Radisson Suite Beach Resort is a first class hotel, located just south of Naples on Marco Island, the largest of Florida's famous Ten Thousand Islands. The South Seas Luxury Condos is a complex of inviting two-bedroom two-bath condominiums with full kitchens and sweeping panoramic views of the Gulf of Mexico. Marco Island Lakeside Inn is a cozy island getaway nestled between soaring palm trees and located on Marco Island, the most southern island on the Florida west coast. Our 19-suite Marco Island Inn offers two two-bedroom suites, 10 one-bedroom suites and seven studio suites. The Marco Island Lakeside Inn sits one mile from Marco Island beaches and boasts a sparkling-heated pool and affordable rates year round! Angler's Cove Condos, clustered on eleven acres on Marco Island, offers you a wonderful bay front retreat at an affordable price. Marco Island Two Bedroom Homes are located within minutes of world-class golf, fishing, tennis, shell collecting, shopping, and dining. Marco Island Four Bedroom Homes are located within minutes of world-class golf, fishing, tennis, shell collecting, shopping, and dining. These beautiful four-bedroom waterfront homes are perfect for extended family vacations. Marco Island Three Bedroom Homes are located within minutes of world-class golf, fishing, tennis, shell collecting, shopping, and dining. These beautiful three-bedroom homes are perfect for extended family vacations. The beachfront Seawinds Hotel, located on the South end of Marco Island, offers breathtaking views of the blue green water of the Gulf of Mexico. Sitting 1 mile from Tigertail Beach, this full service, waterfront hotel is also 10 miles from Everglades National Park. Design your dream at South Seas on the Gulf.